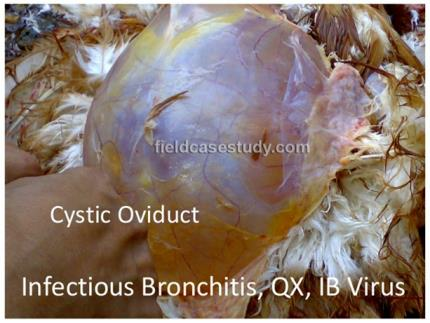 Presentations by poultry health professionals at recent regional meetings have disclosed a field problem of cystic left oviducts associated with false “internal” layers termed ovulating non-layer (ONL) syndrome. The topic was recently the subject of an interactive discussion on a webinar arranged by the American Veterinarians in Egg Production. The most recent re-emergence of the ONL problem in North America was described initially from Ontario and Quebec in early 2017 in young laying flocks demonstrating depressed peak production. Accepting the presumption that infection of pullet chicks occurs during the first two weeks of age, it may be inferred that an IB variant serotype introduced during mid- to late 2016 was responsible for the problem. In the U.S., veterinarians have described the condition in Pennsylvania and Ohio and ONL may possibly occur other Midwest states. The cystic left oviduct condition is sporadic and initial investigations have not disclosed any epidemiologic relationship associated with hatcheries, strains or geographic area. The etiology has yet to be defined although it is presumed that early exposure to a variant of an infectious bronchitis strain or perhaps a new introduction, as in Holland, is most likely responsible for ONL. Coronaviruses have a single-stranded RNA genome predisposing to a high frequency of mutation especially when introduced into large susceptible populations. Because the condition results from early insult to the developing oviduct possibly in the age period of one to 10 days, recognition of the syndrome only after onset of production is inconsistent with isolation of the causal virus. Current research is directed at attempting to isolate viruses from young flocks and also to use SPF Sentinel chicks in an attempt to demonstrate a specific viral agent. Affected flocks show depressed peak production ranging in severity from 5 to 15 percent. By 35 weeks of age, a number of hens may be observed in the flock showing a characteristic “penguin stance”. On palpation, distension of the abdomen is evident. Post mortem examination discloses obvious atresia of sections of the oviduct and one or more cystic dilations. Despite the changes in the oviduct, the ovary is normal in appearance and continues to release ovules which enter the body cavity. Most of the cases observed do not involve peritonitis. Reabsorption of yolk results in intense yellow coloration of the abdominal fat pad. The condition should be distinguished from sporadic and infrequent cases of persistent right oviduct (Mullerian cysts) which may range in size from a few millimeters in diameter to extensive accumulation of a proteinaceous fluid distending the body cavity. ONL should also be differentiated from mild cystic changes in the oviduct of second-cycle hens which do not show any depression in hen week production. Increasing the level of maternal added antibody transfer by administering increased doses of inactivated oil emulsion vaccine to parent breeder flocks. Administering either Ma5 or GA08 live attenuated vaccine to pullet chicks at the hatchery. In Canada, any flock which shows suboptimal peak production is subject to surveillance for the condition, although it has not been possible to establish prevalence rates. In Holland pullet flocks are examined at 12 weeks of age to determine the prevalence of early NOL lesions in order to assess whether the flock should be depopulated if a high proportion of the flock is affected. To date it has not been possible to produce a model system to reproduce the condition, although this direction of research is under review. The take-home message from the recent AVEP webinar and discussion with colleagues is that infectious bronchitis vaccination at the hatchery may be protective, but in the absence of either a model to reproduce the condition or isolation of an agent which satisfies Koch’s postulates, it is impossible to provide recommendations supported by controlled trials involving vaccination and challenge. Given previous history it is possible that the variant IB strain or new genus will infect parent flocks inducing protective maternal antibody. In this respect egg producers are at a disadvantage compared with broiler integrators. Broiler chicks are generally placed in close proximity to their parent flocks. Day-old pullet chicks are frequently placed at a distance from their parents and would be potentially exposed to the causal virus within the first two weeks of placement.